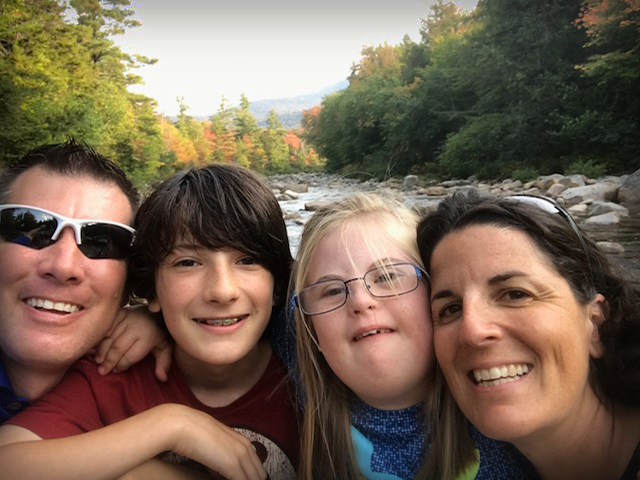 Carrie Woodcock is director of the Maine Parent Federation and a parent of 10-year-old Sami who has Down syndrome. This summer, I attended a conference alongside doctors, nurses, physician assistants, therapists and other medical professionals, all of whom work with children with special healthcare needs and disabilities. I was there to represent parent voices as the director of the Maine Parent Federation, an OSEP-funded Parent Information Center. I am a big supporter of, and was very excited for, the keynote presenter that day, Dr. Brian Skotko. Dr. Skotko is a genetic specialist and co-director of the Massachusetts General Hospital Down Syndrome Program. He has also gone on to facilitate the creation of many such clinical programs throughout Massachusetts. I was first introduced to him at the annual Massachusetts Down Syndrome Conference. I was so impressed with our first encounter that now, whenever I attend events at which he’s speaking, I always attend his sessions—regardless of their subject matter—and always walk away having learned something new. At the conference we attended this summer, Dr. Skotko discussed the impact of a Down syndrome diagnosis on the immediate family. He and his staff had conducted some of the first surveys of parents, siblings and individuals with Down syndrome. To say that I was thrilled that a physician and sibling of an individual with Down syndrome himself took this opportunity to raise awareness for family engagement, a crucial subject many times overlooked by medical professionals, was an understatement. His data were brought to life by his personal experiences, and were overwhelmingly positive. They indicated that a large majority of surveyed immediate family members love and are proud of their family member with Down syndrome. During a question and answer period following the presentation, a professional in the front of the room challenged some of the data Dr. Skotko had presented. She brought to his attention that perhaps the data were positively skewed because parents and family members would have guilt associated with speaking negatively about their experiences and, ultimately, their own family member. Well, I am not one to hold my tongue, but I did have to pause to ensure I reigned in my “mommy” emotions and represented the parent voice in an assertive yet positive way. In that moment, memories from my 10 years of being a mom to my precious gift rushed back. Some of the first feelings to come back to me were those that I have been ashamed to admit as a parent. For example, the diagnosis at my daughter’s birth had me thinking that I would always be a parent to a child living at home. The hours in the hospital enduring her open heart surgeries had brought me emotionally to my knees, wishing my child was healthy. I recalled the times her anxiety caused bathroom accidents in public places, which had me wishing for normalcy. Listening to friends talk about their gifted and talented children had me feeling like an outsider. I remember feeling sad because the birthday party and play date invites were few and far between, if at all. For a second I thought that maybe this woman was right; maybe I do sugar coat my family’s reality because I am too ashamed to admit otherwise. But in the next moment, I saw Sami’s hand reaching for my mom’s face, days after open heart surgery. This was the first expression of her personality shining through. I remembered my toddler son translating her words and being so proud that he was the only one who could understand her. We celebrated her first everything and then celebrated her first everything all over again when she regained a lost skill. I recalled the way that, no matter where we are, she makes people smile, no matter what kind of day they may be having. And the oh-so-many little things in life I would have completely overlooked were it not for her. However, we celebrate and appreciate all that is positive. We do this in a way that is bigger than any outsider could know, and we do it time and time again. The impact has been so positive—my family completely changed for the better the moment Sami came into our lives. In addition to the daily joy we experience with her, all of us are dedicated to her cause, and the cause of others. My professional career has shifted from sales and marketing to assisting families with their own special loved ones. My husband, who was and still is a physical education teacher, has brought her spirit to the way he interacts with his students, including those with special needs. Lastly, but perhaps my proudest family accomplishment, is how Sami refers to her 13-year-old brother as her hero. No matter the circumstance, he shows no embarrassment towards her, only love and admiration. Director of the Maine Parent Federation and a parent of 10-year-old Sami who has Down syndrome.